A bleak, rainy day in April finds me hungry, deliriously jet-lagged, and loathe to venture far to replenish our larder. We’ve been roaming the bottom of the earth for several weeks, and have returned to the remnants of Michigan’s most ruthless of winters – snarly friends and pitted piles of sooted, melting ice lie in the wake. Yawning, sharp-toothed potholes threaten to bust a tire if I’m not on top of my game – heck – I’m not even at the bottom of my game, but somewhere deep beneath: I’m in a half-baked ramen state of mind. Tonight’s version of ramen; a compromise between instant and homemade. And I have to have it now. I know there’s an ocean of difference between traditional ramen and the cello-pack noodles accompanied by that ubiquitous foil square hosting any number of magical, mystery ingredients. I also know better than to diss this staple that kept my kids from starving as they worked their way through college. In Japan, however, ramen is the antithesis of fast-food; an art form at the finest ramen shops in Tokyo. You’ll also find excellent ramen in every major city across the globe, and a myriad of delicious concoctions at Ann Arbor’s Tomuken Noodle Bar on Liberty. Tonight I’m compromising, accessorizing the packaged noodles with vegetables, and substituting miso paste, et al., for that aforementioned packet of questionable origin. The Australian National Flag; New Zealand will likely redesign their flag, but it's unlikely that the Aussies will follow suit. The Sydney Opera House - a multi-venue performance art and architectural masterpiece – resembles billowing sails. In 2007, this iconic multiple performance venue was designated a UNESCO world heritage site. We enjoyed Mozart's "The Magic Flute", one of the 3,000 events hosted each year. Who knew we could have saved big bucks if we'd chosen a tour option, which would have reduced the price of the tickets AND included a tour! Now YOU know. Tasmanian oysters were the creamiest, most full-flavored mollusks I've ever tasted, located at water's edge, The Sydney Cove, Circular Quay. We stayed in The Rocks, Sydney's city center, established after the colony's formation in 1788. The free daily tour is a terrific orientation to this historic area. Susannah Place; a historic house in The Rocks, is now a museum documenting the working class of Sydney in the mid-eighteen-hundreds. The original buildings were made from local sandstone, giving the area its name. Now mostly gentrified, it was once a slum frequented by sailors and prostitutes. Countries such as Russia and the United States, have banned the import of kangaroo by-products, citing health and environmental concerns. Sydney menus, however, are replete with 'Roo, the lean meat adorning plates is certified, sustainably managed and free-range. I enjoyed it as part of a tasting menu at The Wine Odyssey in The Rocks. Australia and New Zealand both claim to have invented the Pavlova, a light meringue concoction of whipped cream and fruit named after the great Russian prima ballerina, Anna Pavlova. Hiking the string of beach towns along coastal cliffs from Coogee to Bondi Beach is a must. Three hours were well-spent experiencing Pacific panorama's in Sydney's uber-charged surfer/beach culture. A rock resembling a morel mushroom near Bondi Beach. Reward yourself with Fish & Chips at "Bondi Icebergs" at the hike's conclusion – the pic usurps all superlatives about the view. Chinatown, a couple of blocks from Darling Harbor, is a marvelous way of experiencing the diversity of Sydney. The Dixon House Food Court, located in subterranean Chinatown, was crammed with stalls hawking everything from Sichuan hot pots to Cantonese dumplings. A sensorial explosion of China, Japan, Vietnam, and Korea; sweating bodies, crying babies, vendors shouting numbers…low rent, dingy, delicious...you gotta' experience! The Chinese Garden of Friendship provided a stunning, tranquil antidote to the chaos of lunch. All roads lead back to ramen; pots of the stuff dot sternos across the landscape. Heat oil over medium-low heat in a Dutch oven or other wide-lipped pan. Stir in garlic and cook until just fragrant, taking care not to burn. 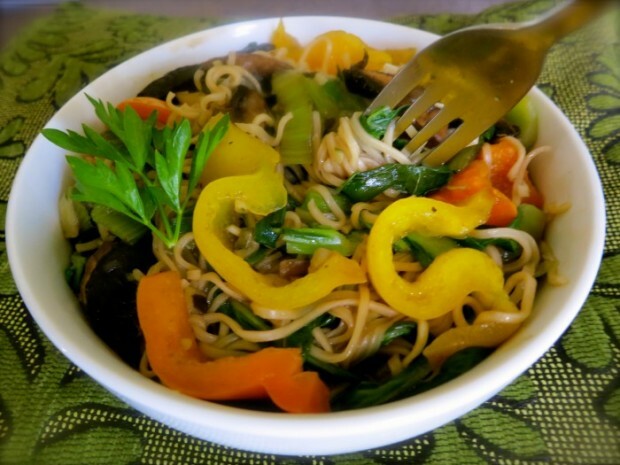 Stir in sliced peppers and bok choy stems, reserving leaves. Cook until just tender, stirring occasionally. Stir in ginger and mushrooms. Combine hot water and miso and stir into vegetables; bring to a low boil. 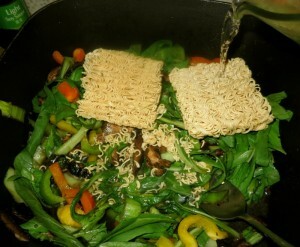 Stir in noodles and reduce heat to medium. Cook until noodles are just tender. Stir in bok choy leaves and cook until vibrant green. Serve with choice of spicy condiment and chopped cilantro, if using.